In addition to single-carded figures, box sets and comic packs, Toys Я Us is also selling the new GI Joe figures in exclusive three-packs. The second series of these exclusives has three sets, including the Iron Grenadier Command. Climb the ranks of the Iron Grenadier troops, the private army created by Destro! Those who aspire to join this elite force must first demonstrate their worthiness. To even be considered, troopers must exhibit battle-hardened skills in the field, and they achieve the rank of officer only after proving their ability to incite conflict and turmoil. The highest commander is Destro, who leads with military brilliance and utter ruthlessness. These command sets are sold in nice display-worthy packaging, with the figures standing in three conjoined tubes in front of their faction symbol. The figures are generally re-releases and repaints, but typically repainted enough to make them stand out. Switching Cobra Commander's uniform to red, for instance. It's yet another way to re-use the molds, save some money and put toys in the fans' hands. Once a major supplier and advisor to the Cobra organization, Destro now purses his own diabolical aims. Building up a small army of Iron Grenadier troopers from his private bodyguards, he incites unrest in unstable coutries, creating new markets for his armament. As his influence grows around the world, he dreams the dreams that Cobra Commander once dreamed. 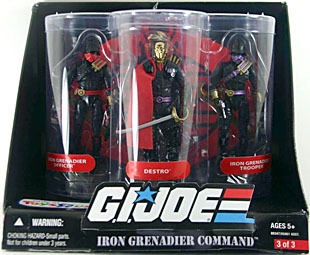 The central figure in this set is Destro, leader of the Iron Grenadiers. Yes, this is the same figure released at the beginning of 2008, but there have been several simple changes made to keep this from being a straight re-release. 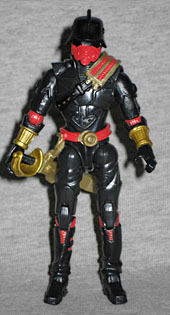 The costume is Destro's second look, a far more military uniform than the high collar and disco medallion. He's wearing high boots, a heavily padded shirt, armor on his left shoulder and a cape on his right. Destro's head is vac-metallized, sadly, but he's switched his mask from silver to gold. Apparently arms dealing is lucrative. Destro's making it rain! 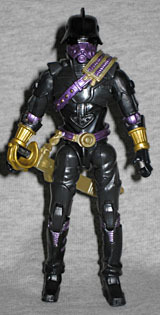 Though his armor is high gloss black, the cloth uniform beneath it has been redone in grey; additionally, his belt and scabbard are now purple, instead of gold. His ascot is still red, but the symbol over his heart is now purple, as well. 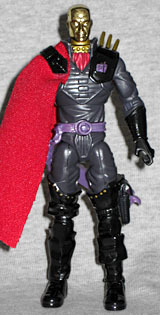 Destro in this multi-pack has the same two weapons as his previous release: a large sword, and a simple revolver. He can hold both, or store them on his person: the sword hangs from his belt, while the gun holsters on his left thigh. In the solo release, the gun is gold, but here it's a much nicer grey (the other release offers it in yellowish gold). Destro has built up his army of Iron Grenadier troopers from among his body guards. Chosen for their endurance, tenacity and pure meanness, Iron Grenadier troopers are part of the weapon supplier's plans to take control of the Cobra organization. The Iron Grenadier force has been trained to infiltrate an area and spread panic and chaos, resulting in an increased demand for weapons - supplied by Destro, of course. An Iron Grenadier trooper is like an obnoxious salesman with guns. In fact, he gets a commission on any armaments sold because of his efforts, and receives incentive points for starting riots and encouraging armed revolts. Just want to take a moment to point something out, here: this set includes a normal Iron Grenadier trooper and an Iron Grenadier officer, but it misidentifies them; both the labels on the box and the filecards inside have them reversed. Now before you complain that I'm just being mule-headed, let's use logic. There's an Iron Grenadier in a current comic pack. There's another IG in an upcoming comic pack. Now, unless those are both supposed to be "officers," the one in this set that looks like them is the trooper, the one that doesn't is the officer, and the names on the box are wrong. Among the castle guards and mercenaries who have become a private army for Destro are those who apire to a higher rank, one with more responsibility, more chances to apply their military acumen, and opportunities to exert complete control over others. Iron Grenadier officers command squadrons that are sent by Destro around the world to cause conflict and chaos. If the "grunts" of this elite force attack like iron fists in battle, the officers in charge of them surge into combat like iron sledgehammers, smashing anything in their path. As a bonus for their superior work, Iron Grenadier officers receive an additional percentage of all weapon sales conducted by their squadrons. The Grenadiers share the majority of their sculpt with Armored Cobra Commander, a choice that works really well. With the body repainted black, the armor looks quite distinct. And since we're meant to believe that Destro had his company, M.A.R.S., design the Commander's armor, it's not out of the question that he'd outfit his own troops in a similar derivative; only the shins are new pieces. The suits are accented with a golden shoulder pad on the left side, and colored panels at the elbows and knees. The uniform is topped off by a finned helmet and a gas mask. They share Destro's belt, but in their thematically appropriate color: one of the figures in the set gets a bright red, while the other receives a metallic purple. According to the packaging, the purple is the low-level grunt, and the red is the officer. Now, does that seem right to you? Of course not. Since the red is more plentiful (appearing in two other sets besides this one), it only makes sense that he's the trooper, while the unique purple IG is his overseer. It's not like this type of error is unheard of for Hasbro: read our reviews of Skywarp and Sunstreaker for other examples. Impressively, the Iron Grenadiers come with the same three weapons today as they did in 1988: a sword, an Uzi and a small pistol. The sword can be removed from its scabbard, which is a clear improvement, and though the machine gun is oversized, the pistol is nice and simple - even color-coded to its owner! All three figures in the set include a display base, as well, for what that's worth. Whether you want to identify these figures by their proper names, or do it the way Hasbro seems to, this is a good set. It's currently the only way to efficiently get more than one Iron Grenadier, and the colors used on Destro are actually better than on his single-carded release. The purple belt is distracting, but the grey used for the cloth gives the figure depth. This is a TRU exclusive, so if you see it, don't hesitate - getting three figures (and all their accessories) for $15.99 is a good deal.